Miss Universe 2018 Catriona Gray has only been in New York City for a few days but she has already been busy with a whirlwind of activities on American TV shows based in the city. She spent a few minutes on ABC’s “Good Morning America”, sharing her advocacy to provide education to poor children. Her mom’s dream when she was 13 years old was taken up on the show, with Catriona saying she wasn’t really interested in pageants back then. So, when her mom told her she dreamt of Catriona winning the Miss Universe in a red dress, she wasn’t really too excited about it until this was recalled after she won the title, in a red dress! Because Catriona also loves music and actually has a great singing voice, she was asked whether she might be seen in a show soon. 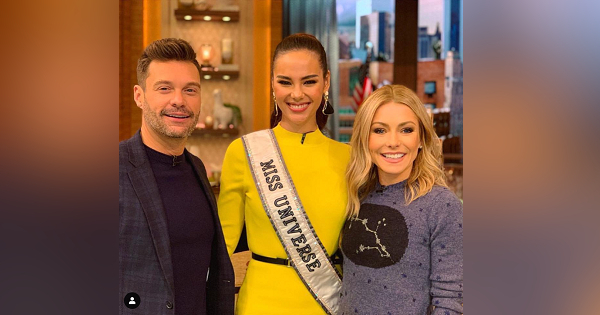 The gorgeous Miss Universe readily admitted that she would love to be part of a benefit concert, to merge her love for music with giving back to those in need. But her longer interview on “Live Kelly and Ryan” earned much praise on social media. Kelly pointed out that Catriona had won as Little Miss Philippines back when she was still 5 years old. The talk show host remarked that Catriona appears to not have changed since her Little Miss Philippines days, as she does look like a star even as a kid. On the show, the beauty queen shared how she had also gone through an awkward phase as a teenager, especially because she was much taller than everyone. At 12, she already stood 5’ 8”! This made her shun away from sports when she used to be quite sporty as a kid. When asked about her advocacy, Catriona had a very passionate answer. “I really believe that education is transformative, it's something that you can give to a child or to a person that can never be taken away from them which is why I'm so passionate about it. Her answer was delivered with so much passion that Ryan Seacrest was greatly impressed. “Here's an example of good parenting. I'm just thinking, 'Wow! Your parents must be remarkable!’” Ryan remarked. The talk show hosts aren’t the only ones who were impressed by Catriona’s interviews on the American TV shows. Her videos landed on the trending list on YouTube, with a lot of netizens expressing praise and admiration for the young lady.